"It is often said that the 1832 [British Voting] Reform Bill gave political power to 'the middle class'. That concept begs many questions, but without discussing them here, we may safely say that on no plausible definition of the middle classes can the proposition be justified as it stands. Parliament could not disregard the wishes of the northern manufacturers and their ancillaries, nor of the great commercial interests in the country: hence the Reform Act of 1832 and the fiscal revolution initiated by [Prime Minister Sir Robert] Peel. But the 'middle classes' were not in a position, nor did they wish, to dominate Parliament. The political influence of land was still immense. As late as 1870 four hundred peers were reckoned to own over one-sixth of the whole surface of the country. It is not sur­prising that Cabinet and Parliament, lower as well as upper House, were overwhelmingly aristocratic in composition. A painting by Sir George Hayter that commemorates the passing of the Reform Act. "For this was the real hey-day of that 'Venetian constitution' which, Disraeli believed, had dominated eighteenth-century England, reduced the King to a mere 'doge', and thus 'in the selfish strife of factions ... blotted out of the history of England, the Monarch and the Multitude'. In fact, Disraeli's picture of eigh­teenth-century politics is a caricature, and the monarch was very far from being a doge. But it was a much truer picture of the situa­tion in his own day. Disraeli had no real historical sense; he wrote propaganda, not history, and projected the circumstances of his own times into the past. 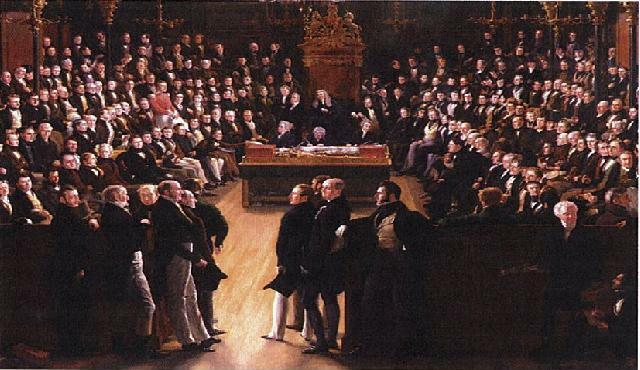 Between 1832 and 1867 the monarch was indeed on the way to becoming a doge, although the very confusion of parties left the Crown with a residue of real power; and 'the multitude', balked of a voice in Parliament and expressing itself in the wild vagaries of Chartism [the movement to increase voting eligibility], might well appear to have been blotted out, if not from history, at least from the calculations of politicians."